The Sony A7R III is the epitome of competence, whatever your genre of photography. Only the more demanding sports and wildlife photographers will need the A9, while landscape and studio photographers will struggle to find a better full-frame camera. In the A7R III, Sony has built on the already impressive full-frame Mark II model, by creating a high-resolution and high-speed camera. Think of this Sony as part A7R II and part A9, all rolled into one. It does for mirrorless what the Nikon D850 does for the DSLR world: appearing to be the most competent full-frame mirrorless camera for all kinds of photography. In our time with the Sony, we've taken particular interest in the areas of improvement over the A7R II. We've tested the Mark III in a variety of scenarios: for high-speed action at the London Aquatic Centre; in the studio; and around the hustle and bustle of London's east end at night. Here's how we got on. On paper the sensor of the A7R III appears to be identical to that found in the A7R II. That's no bad thing as you'd struggle to find a more competent full-frame sensor. With 42.4-million pixels of resolution, the most demanding landscape and studio photographers will appreciate the great level of sharp detail. However, Sony makes some big claims about the new camera: the new-and-improved Bionz X processor delivers an ISO 100-32,000 sensitivity range (a negligible extra 1/3EV native range); its low-light performance at higher ISO settings is said to be bettered by around 1EV; it offers better colour reproduction (especially for skin tones); plus improved dynamic range (DxOMark backs up these claims, measuring the A7R III's dynamic range at 14.7EV at ISO 100, while the A7R II has a dynamic range of 13.9EV). Our studio portraits do indeed have a lovely colour rendition, with spot-on skin tones. We have also been particularly impressed by the sharp detail and wide dynamic range: there is good detail in highlight areas and it is possible to recover a lot of clean highlight and shadow detail from raw files. In short: the A7 III's images have blown us away. The video specification between the A7R III and A7R II is also similar. You get 5K oversampled footage output at 4K, up to 30fps at 100Mbps. At 1080p resolution, the Mark III has a maximum frame-rate of 120fps (which in the A7R II is only possible at 720p). Otherwise, we're only looking at tweaks to video features. The A7R III now includes S-Log3 as well as S-Log2 (lacking in the A9), plus a new HLG (Hybrid Log Gamma) profile for an instant HDR (High Dynamic Range) workflow. It being a high-end Sony mirrorless means video features are aplenty, with improved 5-axis in-body-image-stabilisation, plus headphone and microphone ports. Where the A7R II is really suited to high-resolution photography only, the A7R III throws in high-speed competence. Burst shooting is upped from 5fps to 10fps and the new processor ensures that burst shooting sequences last three times longer. That 10fps rate in the Mark III is maintained for up to 28 raw & 76 JPEG images, while the A7R II is limited to nine raw & 24 JPEG images. Performance is not a patch on the A9, though, which we used alongside the A7R III. That said, after really testing the Mark III out we would not hesitate to recommend it to most users for shooting sports, wildlife and weddings (especially with its silent shutter that will not disturb your subjects). Waiting time for image processing does occur, but not as much as we expected. While burst shooting images are being processed, it is possible to navigate the camera menus, view the most recent images and keep track of how many images in the sequence remain to be processed. Full camera control is only possible when those images have been fully processed, however. As well as shooting twice-as-fast as the A7R II, the A7R III autofocuses with twice the speed, including for Eye AF (where the camera recognises a subject's eyes and autofocuses accordingly). It's really, really fast. The A7R III features a hybrid phase-detection and contrast-detection autofocus (AF) system. On-sensor phase-detection AF is the same 399-point array in both cameras, but the contrast-detection AF system in the Mark III has had a major upgrade: in the A7R II, contrast detection is a modest 25-point array, while in the A7R III it's a 425-point array (albeit across a similar frame coverage). AF sensitivity is also improved by 1EV, acquiring a sharp focus down to -3EV compared to -2EV. If you factor in the twice-as-fast burst shooting and the twice-as-accurate AF, you might expect to get four times the number of useable shots with the A7R III in a fast action sequence. We used the A7R III indoors at a swimming pool for high-speed action, shooting professional divers from a 10m platform. This scenario presented us with moderate lighting conditions and a relatively clean background. Overall, once the camera had acquired an initial focus of the divers (whose motion remained at a similar distance to the camera), all the shots in a sequence were sharp. We also got to photograph a swimmer going at speed towards the camera, which presented a sterner challenge. Not only was he swimming towards us, but disappearing and reappearing from the disturbed water with every butterfly stroke - but most shots from the camera were in focus as he re-emerged from the water. Closer to the camera, however, and we got a few collections of out-of-focus swim strokes. Also, autofocus can at times get distracted by background subjects. Still, it didn't take us long to get the money shot. To back-up its high-speed credentials, the Mark III borrows a few design features from the A9. These include dual SD card slots, one of which is the fastest UHS-II compliant type. You'll definitely need a UHS-II card to make the most out of the high-speed performance and 4K video recording. There is also the AF joystick and AF-On button, as found in the A9. The AF joystick is particularly useful for sports photography, where it is possible to select the AF point more quickly and reset to the centre point, like in the reliable Expand Flexible Spot AF mode. The A7R III is a relatively small camera, but the grip is slightly larger than the Mark II model - with a deeper recess that is much more comfortable to hold. That said, the Mark III is dwarfed by most Sony glass, making for a front-heavy combination. Even with the deeper grip, we'd recommend the optional battery grip when using longer lenses. The deeper grip helps to hold a more capacious battery unit too, offering a much better battery life. This NP-FZ100 battery (also used in the A9) gives almost twice the number of shots on a full charge than the battery used in previous-generation Sony cameras. That's 650 shots compared to 390 shots, or 100 minutes 4K video recording compared to 50 minutes. Who'd have thought it was possible to get so excited over a battery? So while battery life still lags behind the DSLR competition, Sony is closing the gap. There has also been a tweaks to the OLED through-the-eye viewfinder (EVF). It's same 3.69-million-dot one with up to 120fps refresh rate as found in the A9. Only the Panasonic Lumix G9 can match those performance figures. So with an improved resolution and refresh rate, the A7R III EVF feels a little more like the real thing. As for the 3.0in rear LCD screen, the resolution is up slightly to 1.44-million-dots. More significantly, the A7R III LCD screen is now touch-sensitive for focusing, including when using the EVF via the Touch Pad function. There are certainly better touchscreens out there, but it's a step in the right direction for Sony. Regarding connectivity, the A7R III has dual USB slots with a new USB 3.1 Type C port, which is quicker than the Micro-USB 2.0 port of the A7R II when transferring images. You also get a flash sync connection, which is great for the studio. 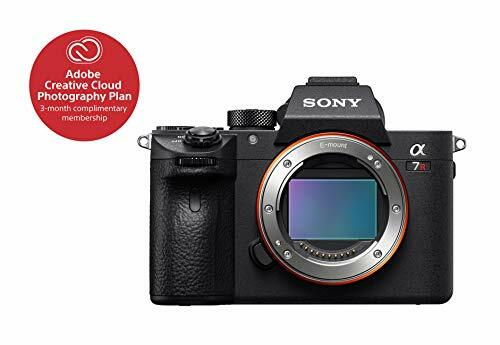 Sony claims that the 5-axis sensor-shift image stabilisation of the A7R III gives up to 5.5EV stabilisation, which is a 1EV improvement over the A7R II. Stabilisation is selected primarily through an OSS lens like the new 24-105mm f/4, or otherwise through the camera. As if 42.4-million-pixels is not enough, Sony has introduced a new feature called Pixel Shift Multi Shooting mode (similar to those found in Panasonic and Olympus mirrorless cameras). This combines four images, sequentially shifting the sensor by one pixel between each four shots. In theory the resolution of a picture taken in this mode is four times that of the full resolution image, at around 170MP. You will most definitely need a sturdy tripod and totally static subject in order to get workable results (a Sony spokesperson tells us that the floor the tripod is sat upon to needs to be completely stable). In terms of all-round competence, the Sony A7R III goes head-to-head with the Nikon D850 as the best full-frame camera money can buy. Indeed, the Pocket-lint team, alongside a panel of judges and the public voted it the best camera of 2018 in the Pocket-lint Gadget Awards. The A7R III offers fractional image quality improvements over the hard-to-beat A7R II - not in resolution terms, but in dynamic range levels. Again, video recording is much the same, which is no bad thing - after all, Sony is one of the innovators in this field. Where the A7R III really shines over its predecessor, however, is in its overall handling and operational speed. Burst shooting, image processing, autofocus speed and accuracy are all vastly quicker. We also really enjoy the viewfinder with its improved resolution and refresh rate, the AF joystick for quick AF point adjustments, the superior battery life and twin SD card slots. Ok, so it's quite a different proposition, being a DSLR and running a totally different lens system, but oh wow is the D850's image quality staggering. The Sony might tempt you away for speed and video though.